Jack Ruby was put on trial for the murder of Lee Harvey Oswald, the man in Dallas Police custody for the assassination of President John F. Kennedy two days earlier. We'll bring you the story from both inside and outside the courtroom. In this episode, you'll hear the first murder ever caught on live television, quotes from the larger than life lawyers for Jack Ruby, and from Jack Ruby himself. 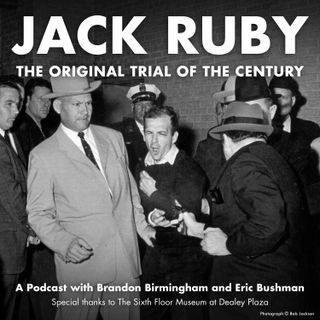 Beginning March 3, and for each day of the trial thereafter, Eric Bushman and Brandon ... See More Birmingham bring you the story of The State of Texas v. Jack Ruby - The Original Trial of the Century.